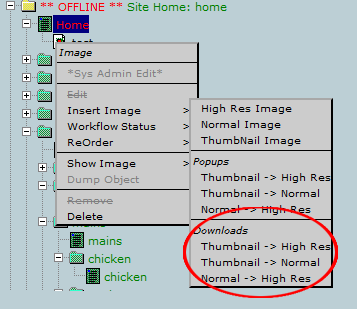 We had a number of requests enable the 'download' of an image from a thumbnail instead of having it 'pop up' to a larger view. There is now a 3rd style of insert image from your administration tree. If you wish to have clients, friends or families download (save) an image from a thumbnail, simply select from the download section of the menu. See below.